Victoria Bowling Club » Well done Lui and Linda! Well done Lui and Linda! You are here: Home » Blog » Competitions » Well done Lui and Linda! 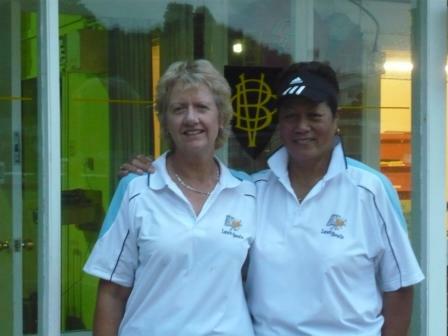 Lui Hare (Johnsonville) and Linda Ralph (Auckland) won the $2000 prizemoney in the final of the 7th Speight’s Victoria Women’s Invitation 2-4-2 Pairs beating Tanya Wheeler (Petone Central) and Sarah Taukamo (Victoria) 16-11. It all looked plain sailing for Hare and Ralph as they raced out to a 13-3 lead after 8 of the 12 ends, but a three, and then a five when Wheeler ran the jack in the ditch, made for a tense last two ends. They held their nerve to win those ends repeating a victory they had in Saturday’s section play over the same pair. Hare and last year’s NZ Club Singles winner Ralph needed to beat this year’s NZ Club Singles finalist Tanya Wheeler (Petone Central) and Sarah Taukamo (Victoria) in the last match on Saturday to make it through to the top section. Wheeler and Taukamo came through a particularly hard Sunday draw beating 2009 winners Helen King (Victoria) and Karen Coombes (Canterbury) by 20, 2011 winners Kirsten and Leigh Griffin (Victoria) by 2, and last year’s champion Serena Mathews playing with Tayla Bruce (Canterbury) by 4. The Griffins were runner-up in the section sharing 3rd place in the tournament with Nina De Munnik (Victoria) and Wynette McGlachlan (South Otago). The Plate winners were MaryAnn Wilson (Victoria) and Christine Allan (Bay of Plenty) in one group, and Nicole Toomey (Victoria) and Fiona McKinley (Hutt) in the other. Full results can be found on the Invitation 2-4-2 Pairs competitions page.